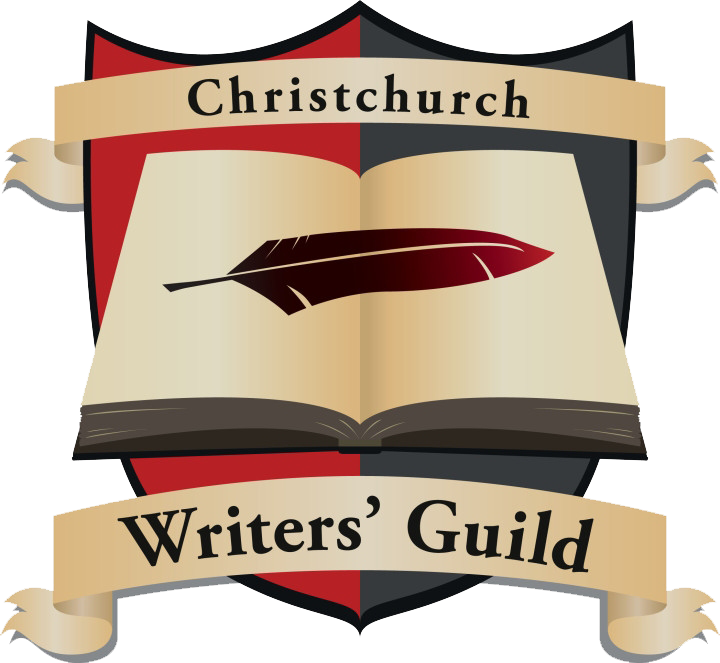 Recently, the Christchurch Writers’ Guild held their first ever annual awards dinner. As part of the awards, our members were invited to share snippets of their writing. This is just one of the extracts that graced the imaginations of our membership. 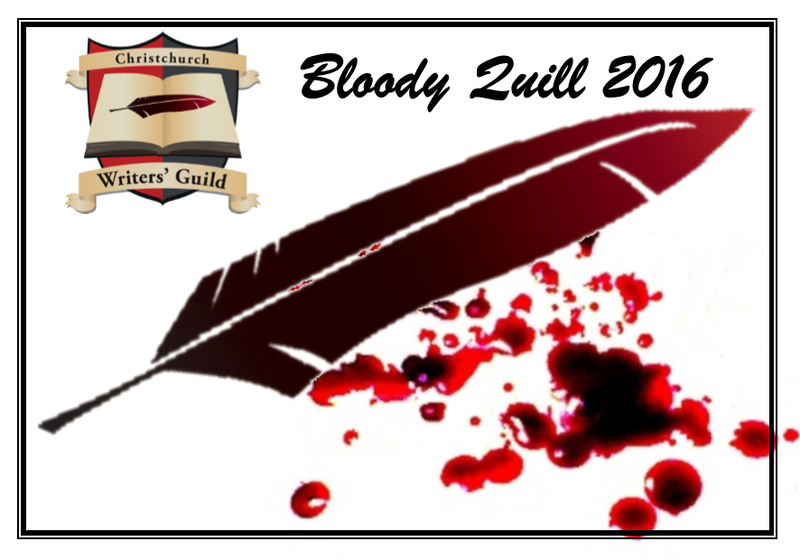 This snippet was submitted by Angela Oliver for consideration for the Bloody Quill, stories about death scenes. Ombra’s dreams were drenched in blood. Even the ghostly murmurings of the Lemures, trapped with Noir’s trophies, did little to offer comfort and relief. They mocked him. There came a sliding, grinding sound and the trapdoor crashed open, the bright light an assault against Ombra’s night-touched eyes. Noir loomed, a dark silhouette above. Hunting? Hunting what? Ombra knew better than to ask. Noir did not appreciate questions, or anything except answers. The young simpona dragged himself up, out of the pit. Ombra shook his head and stared at the floor. Three fossa cubs were wrestling, one gnawing industriously on the other’s tail. Kaikitra lazed in a patch of sunlight near the entrance way, the fourth cub stretched out across its mother’s rump. “They are nearly seven moons old,” Noir declared. “It is time for their first real hunt.” He pushed one of the cubs out of the way with his foot, eliciting a scream of surprise, or possibly pain. The big red antelope grazed patiently at the foot of the tree. Ombra hurried to heave on the riding platform and harness. It was heavy and cumbersome, but after six moons under Noir’s command, Ombra had developed strength and skill enough to quickly get the antelope ready. The cubs had trailed their mother from the tree house, and now scrambled through the branches, playing tag and trying to grab each others’ tails. Noir cracked his whip and they all froze. “Here,” he growled. One dawdled a moment too long, obsessively chewing a large leaf, and it suffered the sting of the whip with a squeal of pain. Kaikitra already stood beside the antelope, ears perked and head held high and alert, eager for the chase, the hunt. “Do not forget my kibay,” Noir instructed, scowling at Ombra. He sprang easily up onto the antelope’s riding platform. The young simpona scrambled to obey, racing up to the tree-house to fetch the sturdy carved stick, its sturdy head stained in darker shades. How many lemurs had it killed? Ombra dared not think. Ombra put his hand to his stinging cheek, his fingers came away sticky. A heartbeat later, and Ombra took his position on the riding platform, crouching low at the front and clinging with both feet. Noir whipped the antelope into action, urging it deeper into the forest. Ombra’s heart sank as they passed the lake; they were headed for the Low Quarter. The fossa flowed around them, Kaikitra striding to the front, whiskers forward as it scented the air. Behind their mother, the cubs bumbled along, occasionally batting at its tail or tumbling over one another in the leaf mulch. They passed the patch on the lake shore where Rakoto and Eloise had shared time and conversation. White egrets squabbled in the trees. Kaikitra froze, ears pricking high and sharp eyes focused off into the undergrowth. A small dark lemur crouched in the shadow of a bamboo grove. His eyes were wide and his head completely devoid of fur. His fingers tightened about a twig of bamboo. “Kary,” Ombra silently mouthed the name. “Kaikitra, kill!” Noir shouted, striking down with his whip. The fossa sprang into action, three of the cubs trailing after it. Kary roared an alarm call, dropped his bamboo twig and leaped up into the trees. The fossa followed. It was more agile than the half-starved orphan. Ombra squeaked as those powerful jaws closed about the little bekola. Kary screamed. The fossa shook him into silence and flung him to the ground. “No!” Ombra cried, scrambling to dismount, to run to his once-friend’s aid. Ombra struggled for breath, fingers clutching at the rough leather. Still alive, Kary dragged himself along with his front legs, his spine crushed. One of the cubs crept forward to sniff him. It drew back, then lunged, flipping him over with its snout, batting him with its paws and tossing him in the air. Ombra wanted to close his eyes, to look away, but he could not. He tugged at the whip – it could not yet be too late to save Kary – but the whip bit deep, the edge raw and sharp. Another cub joined in, grasping Kary’s head in its jaws. There came a terrible crunch. The little bekola stopped twitching. Dead. The cubs played with him a few heartbeats longer, then began chasing each others’ tails. Ombra felt the whip slacken against his throat, then something slammed into his back, shoving him off the antelope. The damp leaf litter caught him in its foetid embrace. “You dared to disobey me,” Noir growled. “You let them kill him.” Ombra’s voice was flat, emotionless, as he fought against his grief. So quick, so brutal. One of the cubs bounded over to him, nudging its head against his hip, begging to be scratched. Its jaws dripped red with gore. Ombra recoiled back, stomach heaving. He fought to keep from vomiting. Last time he had thrown up, Noir had made him eat it (“I will not have you waste food”). “Collect it,” Noir instructed. The whip whistled past his ear. Ombra paused, confused. Collect what? Speechless, cold with grief and raw with bitter rage, Ombra approached his fallen friend. He gulped back the rising bile, almost choking on the taste of sour fear. Kary’s cheeky grin now twisted into a grimace of pain and fear, his bright eyes clouded, head crushed and broken. Ombra took off his soiled lamba and laid it across Kary like a shroud. He rolled him up, lifting him. He was so tiny, so light – all skin and bone and blood. So much blood. Ombra walked back slowly, struggling against the great heavy weight of sorrow and fear, so much heavier than his broken burden. The fossa cubs followed, sniffing at him curiously. “You knew it,” Noir declared. Ombra gave a short nod. Ombra obeyed, wincing as Noir shoved Kary’s battered body into one of the saddle bags. “For the cubs, for later,” he said, then tugged out the lamba, rolled it into a wad and flung it at his apprentice. It was sticky with blood and gore, and reeked of fear. Ombra hunched in his foetid robe, one hand clutching the finger-bone. He could do nothing to block out the screams, the howls, as Kaikitra and the vicious cubs cut a path of destruction through the homeless lemurs. Those that were healthy enough escaped up into the trees, but there were many that were not. Some so pitiful that they barely moved, seemed almost to welcome the gaping fangs and powerful claws. Ombra lost count of the number of victims. The smaller of the fossa cubs began to tire, plodding flat-footed with its head lowered. Ombra allowed himself a sigh of relief. His body trembled with the stench of pain and the grief surrounding them. It was all he could do to keep his balance against the antelope’s rocking back. Noir turned his steed and they plodded back out from the Low Quarters. The antelope was just about to step out of the gloom and into the light when Ombra suddenly felt Noir jerk upright behind him. He heard a low chuckle. Ombra looked up. A red-furred lemur crouched on the ground, carefully wrapping one of the previous victims up in a stained lamba. She froze at the sound of hoofs squelching on leaf litter, rose her head and turned to face them. Ombra felt a flicker of recognition and fear. She was the one that had adopted the tiny orphan. He struggled to remember her name. Mit-something? Mitaiza, that was it. Of the kit there was no sign. She probably died moons ago. Mitaiza looked up at him, startled to hear her name, and hesitated for one heartbeat. Kaikitra reached her in three strides and caught her just as she leaped for the trees. One bat from the powerful paws sent her sprawling into the leaf mulch, whilst another pinned her to the ground. The mighty jaws opened, ready to rip and rend. To Ombra’s amazement, Kaikitra obeyed. The fossa stopped, motionless, jaws still gaping. Beneath her, Mitaiza gasped, half-stunned with fear. With a solid gulp, Ombra slipped down behind him. What game was he playing now? “Here.” Noir slipped his kibay into Ombra’s hand. Ombra stared at it in horrified amazement. A long silent pause, in which Kaikitra’s low purring-growl came the only sound. “I want you to kill it,” Noir finished. “K-kill it?” Ombra tripped over the words. Ombra knew only too well. He hefted the kibay in his shaking hands, held it above Mitaiza’s head. She stared up at him, her eyes wide with fear and the certainty of death. He wondered what she could see in his own. He swung the kibay with as much force as he could master, its heavy head connecting in a jaw-crunching blow. “Run!” he shouted as Kaikitra tumbled backwards, sprawling into the leaf-mulch. Followed it up with another blow, cracking it hard across the fossa’s muzzle. This time Mitaiza did not hesitate. She scrambled free and disappeared up into the shadows of the tree. Again and again, Ombra rained blows down on the fossa, all the anger, the rage, the helplessness suddenly expressing itself. It may have fought back, for Ombra felt hot flares that burned and faded, and his fur became sticky with blood. It may have been his, or it may have been the beast’s. Finally, spent, he sagged, leaning on the kibay. Kaikitra was barely recognisable. Its jaw was shattered and broken, the side of the head caved in, fluids leaking into the soil. It was only then that Ombra realised what he had done – he had killed the Hunter’s pet. He looked up, and into Noir’s fiery gaze. 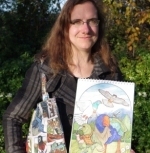 Angela Oliver is an author and illustrator, who prefers writing about animals rather than people. She is currently working on the series she describes as “epic fantasy with lemurs” and struggling her way through second-book-itis. Although from her whimsical art and furry protagonists, she may come across as a writer of the cute and fuzzy, she seems to have a taste for the gruesome.